Hands-On Learning! The K'NEX Education Simple and Compound Machines BuildingSet is designed to expand upon middle school students' (grades 5-9) knowledgeof simple machines concepts. Students investigate, explore and experiment withthe K'NEX simple machine models as they analyze, synthesize, and evaluateinformation. 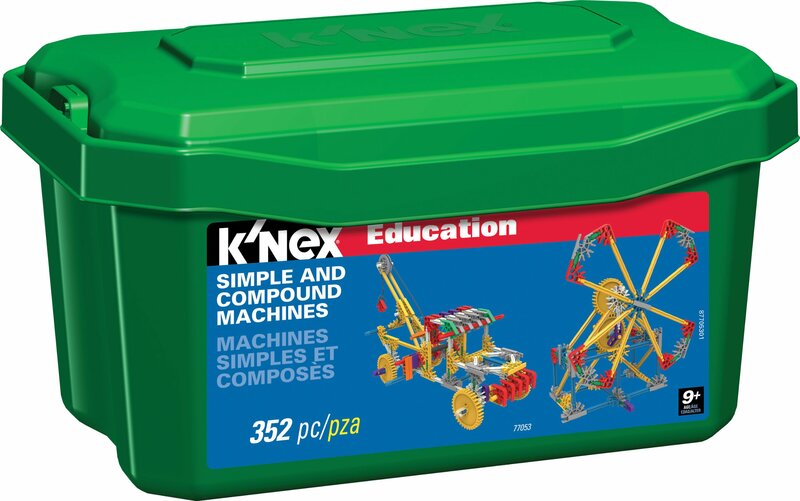 This K'NEX Education Set includes 352 K'NEX parts, buildinginstructions, and a comprehensive Teacher's Guide, all packaged in a strongplastic tray with a snap-on lid for easy classroom storage. There's enoughparts to build 16 fully-functioning replicas of real-world machines, one at atime! Supports 1-2 students. The Teacher's Guide includes Student InquirySheets and Worksheets for the models included in the set. Student Worksheetsask questions about the machine being investigated and present challenges thatcan be used to help students think more deeply about the concepts involved.This set is aligned to STEM standards. STEM Education focuses on science,technology, engineering and mathematics concepts taught through problem-solving, discovery, exploratory learning and critical thinking. STEM Educationrequires students to be active participants in the learning process. K'NEXmodels offer hands-on opportunities that encourage scientific inquiry,investigation and experimentation. Our inquiry-based lessons challengestudents as they build, investigate, problem solve, discuss, and evaluatescientific and design principles in action. From the Manufacturer Hands-On Learning. The K'NEX Education Simple and Compound Machines BuildingSet is designed to expand upon middle school student's knowledge of simplemachines concepts. Students investigate, explore and experiment with the K'NEXsimple machine models as they analyze, synthesize and evaluate information.The Teacher's guide includes Student Inquiry Sheets and Worksheets for themodels highlighted. Student Worksheets ask questions about the machine beinginvestigated and present challenges that can be used to help students thinkmore deeply about the concepts involved. Set includes 352K'NEX parts - enoughto build 16 fully-functioning replicas of real-world machines, one at a time.Supports 1-2 students. Grades 5 - 9. Building instructions and comprehensiveteacher's guide aligned to Science, Technology, Engineering and Math Standardsincluded. Packaged in a strong storage tub with Snap-On lid. STEM Educationfocuses on science, technology, engineering and mathematics concepts taughtthrough problem-solving, discovery, exploratory learning and criticalthinking. STEM Education requires students to be active participants in thelearning. K'NEX models offer hands-on learning opportunities that encouragescientific inquiry, investigation and experimentation. Our inquiry-basedlessons challenge students as they build, investigate, problem solve, discussand evaluate scientific and design principles in action. Aligned to Science,Technology, Engineering and Math standards. Also see K'NEX Education's Introto Simple Machines Series and Simple Machines Deluxe for grades 3 - 5.